So we spent the weekend in *spits* Toronto. Mrs Dufus and I drove down Friday to visit my brother Whitey - all together now "HI WHITEY!" We got there in time for lunch and spent the afternoon talking, swimming in his pool and drinking a few bottles of this wonderful yellow stuff called Corona. Saturday morning Whitey prepared breakfast...Eggs Benedict - make that Eggs Willowdale (the *spits* Toronto neighbourhood where he lives) - for us. Delicious. With the day ahead of us we contemplated what we might do. Taste of Danforth, the Greek food and cultural festival was on, but we weren't very hungry. The Festival of Beer was underway at Exhibition Place, but we already had our own beer festival going. Hmm, what to do? Now a little while back Whitey broke his wrist. He got 6 or seven screws in it. So going golfing was definitely out. He's had his cast off for a couple of weeks but he's still doing physiotherapy. Well, Mrs D came up with the next best thing: mini golf! And putting counts as rehab for Whitey's wrist. So I hopped on my iPad to check out the nearest mini golf location. I found one called Putting Edge and it was on Yonge Street in Richmond Hill. Great, I thought. Whitey lives a block from Yonge Street. It should be really close. 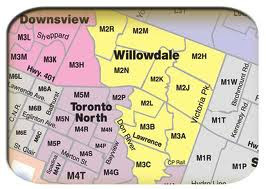 What you don't know is that Yonge Street is known as the longest street in the world starting at the Lake Ontario lakeshore and traversing 1,178 miles to the north, where it turns into Highway 11, to the Ontario-Minnesota border at Rainy River. After about an hour into our travels I was beginning to think we'd be making the entire trip. You see I didn't bother to take down the address. I only noted it was on Yonge Street in Richmond Hill, about a half hour from Whitey's. When we hit Aurora about a half an hour after that we knew we'd somehow missed it. But we stopped at a little rural farmer's market and bought some honey so the day wouldn't be an entire waste. We did find it on the way back after Mrs D asked for directions at a gas station. Neither my brother nor I would have thought of that. Turns out the mini golf was indoors...and you played in the dark on a florescent course. Now that was cool! We had a blast even though we had to contend with birthday party groups that must have consisted of every kid in Richmond Hill. I felt redeemed. We had found the mini golf place AND we'd had a blast. Time for the Dufus and Whitey Festival of Beer. And your iPad doesn't have a map app? But I'm glad it all worked out. Golf in the dark? Isn't there a Springsteen song about that? Woops, no that was Dancing in the Dark! What I didn't realize was this place was tucked away in a strip mall. So we missed it the first time by. When you think of mini golf you think of outdoor, right? Not only did we play golf in the dark but thanks to me we were all in the dark as to where exactly this place was. I was sort of afraid you were going to end up in Vancouver. Thank goodness for sensible women who ask questions at gas stations! Without them, you might be posting from the Empress Hotel in Victoria. Oh I think my brother and I would have recognized our mistake long before Victoria. Regina, maybe. Yum. Eggs Benedict = my favorite breakfast. HI WHITEY! Mini Golf can be MORE fun than real golf! Good thing Mrs D asked for directions! Whitey's Eggs "Willowdale" were devine. (He says "hi" back.) Who needs GPS when you've got Mrs D along. Her talents are endless. My husband always sends me in to get directions, but I'm dyslexic, and even if I write down left, I'll tell him to turn right. If I try to remember directions and not write them down... well, we're screwed. The gps has saved my marriage. Your husband should let YOU drive. My wife always knows where she's going (well, most of the time) to the point she demands she drives. On the trip to *spits* Toronto I let her drive home! NO WAY!!! He is the worst backseat driver, always telling me I'm going to burn out my clutch if I keep driving like Parnelli. Part of my problem is that everything looks familiar and I think you turn here, even if I have never been there before. If I have I can get us there and back, he never remembers. You think that's bad. As well as comments my wife thinks there's a steering wheel and a brake pedal on the passenger side of the car. My father in law used to pull the steering wheel off and hand it to anybody who thought they could do better. That'd get my attention! That's something right out of the Flintstones. Too funny. Must run in the family, I almost took the viva all the way to New Market for sushi... Ended up at the Lone Star in Richmond Hill. Well, Ben, If I'd been in your passenger seat I think we might have ended up at Tim Horton's in North Bay. Wait what? I was in Toronto this weekend too, mostly around Steels/Bathurst. We probably crossed paths! 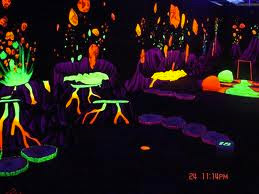 Mini golf is always a good time and add in a black light... fun of course also. Come to think of it...... Old hippies everywhere want to know "How did these not exist in the 60's?" Well I didn't see you at the glow-in-the-dark mini putt! Ha, ha. I knew there was a familiar feel about it. Groovy. dufus: Strip mall? That's why it was so dark. But you would have thought I'd notice the pole. Mike: Crossed paths? Maybe. I think we crossed Steeles six times. Ben, dufus: Just stay away from the traffic circles. Not THAT kind of a strip mall. Even I would have noticed that! Golf GPS Units Simple, fast and accurate has everything in golf requires a GPS receiver. Comes with Insta-Lok technology, powered by the latest SiRF Star III chipset system, anyone immediately calculates the distance to the front, middle and back of the green. Um, good to know my spamming friend. But, like, this was mini-golf. Yeah.